You probably came from Nicole Picadura. If not – you may consider starting from the beginning at Altenew blog and see what other members of Altenew’s design team have come up with (and also you have a chance to win a prize on each hop node). Today we are celebrating the release of 16 stamp sets and 10 dies. And I made three cards for today’s blog hop. The first card is my favorite. The new Spring Daisy stamps set was used here. Before I knew the name of the set I already saw in these flowers not daisies but sunflowers. And after I found out the name of the set I still wanted to make sunflowers. Mostly because they remind me my homeland – Ukraine. I came from the East part of the country and we have so many sunflower fields over there (no surprise that Ukraine is the world’s leader in exporting of sunflower seeds and oil :)). Have you ever seen a sunflower filed? It’s an amazing sight! They’re like living organisms. It’s so adorable when they go to sleep at night closing their petals. And during the day they turn their heads following the Sun (so they are always facing the Sun whenever its position is). Not speaking of food they they give us – sunflower seeds and oil (sunflower oil is mainly used in cooking in Ukraine). I even remember our family growing these yellow buddies in our garden. But back to cardmaking 🙂 To make my card I first stamped my sunflowers using Mango Smoothie, Warm Sunshine and Jet Black inks on card base that I made from Classic Crest Solar White. I masked flowers and leaves so they don’t overlap. Next I masked all flowers and inked the top part of my card using Caribbean Sky ink creating the sky. Next I stamped several flowers and leaves on Classic Crest Solar White cardstock, cut them out and adhered to the card base using foam squares. Added a stripe of white cardstock with the stamped sentiment from Painted Butterflies set. Finished the card adding some clear dots and sequins. To make this card I first stamped all flowers onto Classic Crest Solar White cardstock using Blush, Frosty Pink, Coral Berry inks. And leaves using Frayed Leaf, Forest Glades. Next I cut out all elements with my scissors. Adhered a piece of patterned paper with woodgrain design to a white card base followed by adhering floral cluster onto it. I adhered some elements flat and some – using dimensional foam squares. Added a sentiment from Penned Rose set, stamped on a stripe of white cardstock and several sequins. I like how soft dahlias contrast with dark background. And I like that I used at least 1/1000000 of my PP stash lol. To celebrate this release, Altenew will draw three winners who will each receive a $50 gift certificate to their online store. Please leave a comment on the Altenew blog by Thursday, May 19 11:59pm EST for a chance to win. The winners will be announced on Friday, May 20. I will also randomly choose a winner from comments left on this post and the prize will be $30 gift certificate to Altenew online store. Please leave a comment on this post by Thursday, May 19 11:59pm EST for a chance to win. I will announce the winner here in this post on Friday, May 20. The winner of $30 Gift Certificate is Chris Tate. Congratulations! The next stop in the blog hop will be Sveta Fotinia. If you got lost, please go back to Altenew Blog. Each card is more beautiful than the last! I agree about the sunflowers — I already ordered the set with the same idea in mind….I love that this set can serve for both! the blue background and yellow flowers is just so happy! makes me want to run outside and sit in a garden! Svitlana, all 3 cards are stunning, and I had to laugh at your comment about the Dahlia card using up a small portion of your DP stash. With all the selection you have, you picked the perfect dark wood DP to show off this beautiful floral image. Beautiful cards. Love the dahlia card, always plant lots of them in the Spring. Very lovely cards. Thanks for sharing. Your cards are so beautiful! I like sunflowers, too. beautiful cards. Love the dahlia card. Just got my first Altenew stamp (peony) and just love it. 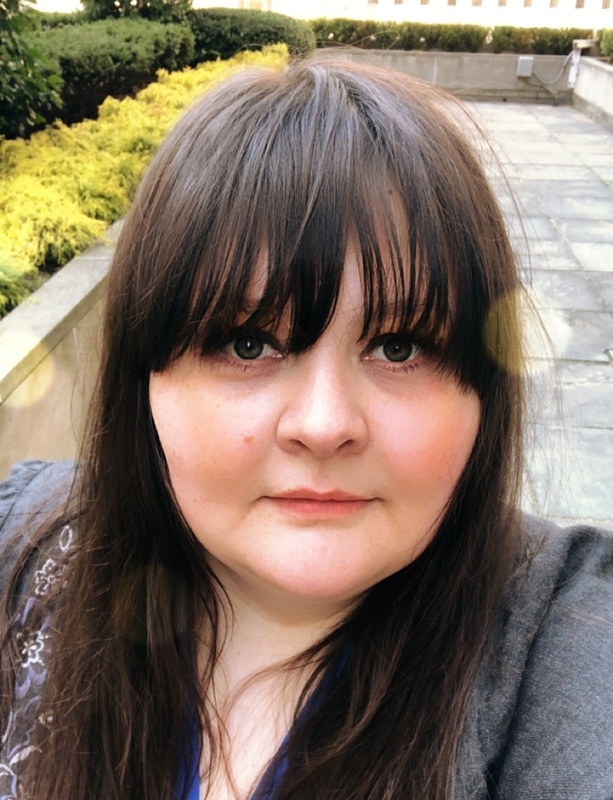 I am using it for my 2018 birthday cards. Trying to decide on the daisy or the majestic bloom for my next purchase. So glad I found this site. Love your cards and especially the sunflowers. On vacation we saw fields of them in Bulgaria..what a sight! Your cards are absolutely stunning, Svitlana! I love how you created the sunflowers from the daisy set and your description of how they grow in your home country took me there! I thought the first set were sunflowers too, love how you used it! I love the Dahlia set, looks great against the wood background too! I love your dahlia card the dark wood grain background is stunning. Beautiful cards with so much variety! Thanks for sharing on the hop. I like the idea of using different tones for the roses – keeps them visually interesting! And I like having a flower background with one or two raised up! Such great ideas! Such pretty cards. I love the bright colors. WOW! Such beautifully stamped and coloured cards. They are all my favourites! ? This release is fabulous! Versatile and lovely, as always. Your cards are so lovely. Stunning cards! The dark wood panel background really gives the flower a pop! Love that woodgrain and pink card! Thank you! Wow–these are all gorgeous cards and stamp sets! Such beautiful colors. Fantastic designs using this new Altenew release! I love your dahlia card the dark wood grain background beautiful. the new flower stamp sets are so great – i want them all – and you’ve given me such wonderful inspiration! Wonderful cards, fabulous new stamps. Just received my first Altenew inks and can’t wait to open them and get crafting. Your cards are so organic and beautiful! Beautiful cards. Love the dark background. Lovely cards Svitlana. The blue background looks great with the daisies. Also love the dark wood panel background with the pretty pink flowers. Great embellishments. I am captivated by your stunning cards…Thank you for sharing your creativity with us! Your floral cards always are spectacular and these are no exception. Jaw-dropping. Your cards are stunning.Beautiful flower stamps arrange so perfectly!Love it! The Dahlia’s against the woodgrain is my favorite. Such striking contrast between soft and rugged. These samples are stunning, Svitlana & so different from everything else I’ve seen. Your fabulous flowers just jump right off the page! Beautiful cards! That wood background is very eye-catching! Your cards are fantastic. All beautiful and different. The pink Dahlias on brown are so pretty. Love your work and the great new Altenew products!! Thank you. Just beautiful! I recently ordered wood grain paper, so you have given me inspiration. . .thank you! Three gorgeous Blooms! You have showcased them so well. I especially like the BG created with the painted rose set, SCRUMPTIOUS!! 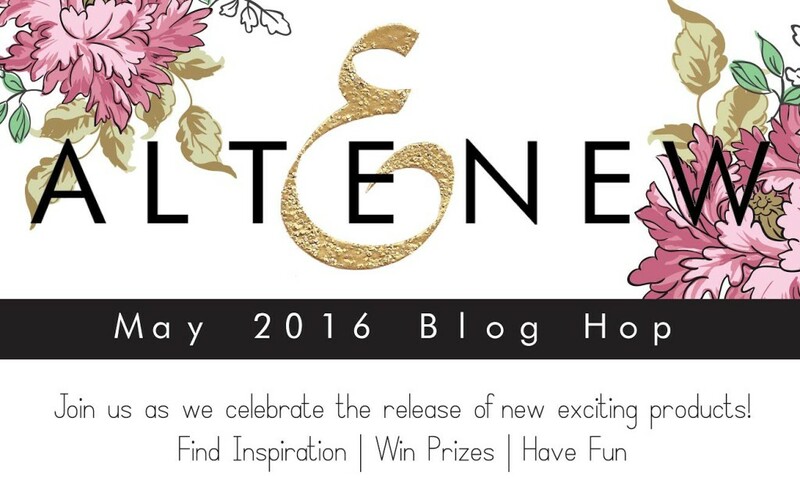 Thrilled to participate in the Altenew Blog Hop! I am fairly new to Altenew and am looking forward to trying them out. What beautiful cards and pretty color combinations. I can’t wait to order the new Spring Daisy set! I absolutely love the colors of gerber daisies, so this new stamp set will allow me to pair it with the amazing colors of ink that Altenew offers to make some beautiful cards for my friends & family. The bright colors are beautiful. Love Altenew products. You make using them look so easy! I love the soft colors, will have to try those on my peony set. Beautiful cards! Your cards turned out so pretty!! Love the Dahlia! So hard not to want all of the Altnew flower stamp sets. Svitlana, I can’t choose a favorite…I live each one of these floral beauties! You’ve done such a beautiful job with these new sets! I can not get enough of Altenew florals! You did an absolutely beautiful job of creating amazing layering, pairing, placement, contrast, and color selections! Such a fantastic visual treat! Thank you! So, so beautiful. I love that woodgrain!!!! Love natural elements…thank you for sharing! Fantastic card designs love your work, this is a great new release from Altenew wish list keeps growing so now my wish is just to be a winner!! What a gorgeous collection of cards!! Wow wow wow lovely to meet you and what can I say beautiful cards. The dali as remind me of my late Dad. The flowers are so striking. I am loving all the new stamp sets released. Especially I love the daisy set, but all the flowers are awesome. Your cards using them are beautifully done and so inspiring. Thanks for sharing. The Dahlias look wonderful against that background. The flowers look gorgeous against the beautiful wood grain paper. The flowers are wonderful. I love all the different colors that you used. The field of sunflowers sounds like an amazing sight. Thanks for sharing. And thank you for some wonderful card inspiration! These cards make me excited for the season. What a beautiful new release! Your cards are stunning ! Love the dahlia blossoms ! The wood grain background of the lotus flowers is stunning ! It compliments the lotus so well. I too live sunflowers as they are like summer personified with their brightness. We have planted in our garden the giant ones which are so amazing. So thank you for your charming cards and also opening up the chance for me to win some product! I love flower cards! I’ll have to try the wood grain background, it adds so much to the card. Gorgeous cards Svitlana! I love your story of the sunflowers. On the outskirts of the small town I moved away from a couple of years ago there was a large field planted with sunflowers. I loved driving by this farm and one year stopped to take pictures from which I created a photo group for my craft room wall, love them. Besides the new Daisy set I also love the Dahlia blossoms and Calligraphy set. Thanks for the beautiful inspiration! All so wonderful Svitlana, love how those Dahlias pop n the dark woodgrain background! ooooo that wood grain card… SWOON! Your cards are all beautiful. Great job using this new release! Beautiful dahlias, daisies and roses! Thank you for the info on sunflowers. I didn’t know any of that. I’m imagining now a field of them looking at the sun. Oh, and I love your work. You are very talented. Your cards are all so very bright and cheerful. I love the arrangements you made with the stamped images. Thanks for the chance to win. Beautiful use of colors. I really like your cards! Outstanding cards! I am super in love with the last one! Those flowers against the wood background is such a fabulous idea! Everything thing is coming up Roses, and Daisies, and Dahliasl— all my favorites of this release. Your cards will brighten the day of the persons who will receive them ! Beautiful cards with new floral stamps! Love your sunflowers :)! Really beautiful new stamp sets. I love your take on them…great inspiration!!! These are all beautiful. Fresh and inspiring! Stunning cards you have created! =) Looks like I need to get some of the stamps to try myself too. Lovely cards, thanks for sharing!!! 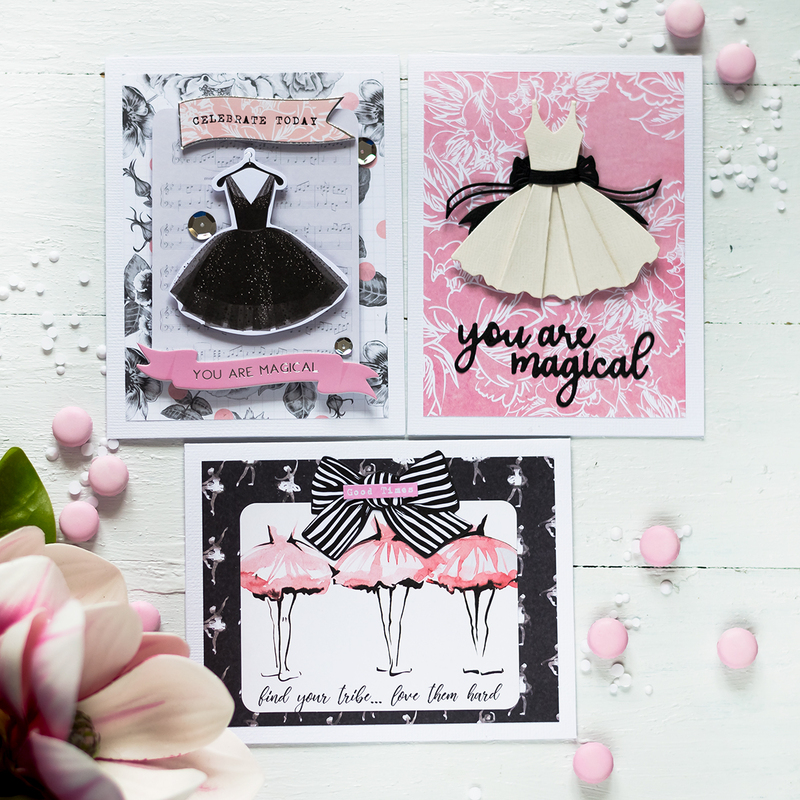 Love your cards…they are just stunning! I love the look of your dahlias against that wood grain background and I think I would really enjoy the site of the sunflowers in the fields of Ukraine. All your cards are lovely. These cards are amazing!!!! I thought that blue one was cardstock. It’s blended/inked so beautifully!!! Wow your cards are all so beautiful! I especially love the pink dahlias on the dark background, it really makes them pop! Such beautiful cards. I’m a fan of florals and these are gorgeous! Your cards as so lovely. Beautiful cards and clear instructions. Thanks. Loved your “sunflower” and the Dahlia. They really do look like sunflowers! Such lovely creations. I am in awe. Fabulous floral cards. Love the last one and how the pink dahlia pops against the dark wood. All of the cards are beautiful! My favorite is the Dahlia against the wood background! Simple but stunning! Thanks for sharing. Very beautiful cards! Love them all. Sunflowers are one of my favourites so I love your first card so much! They are all beautiful but that one is my favorite. Thank you for sharing and for the chance to win! All three cards are a wow! So pretty. Thanks for sharing your talent! Beautiful card, love them all, I really like to do floral card so these stamps and dies are going to be high on my wishlist. Thank you for sharing. Thank you for your design ideas. That dahlia is a mighty fine image that really should find it’s way to my house. I love all the cards, but the Thanks is my favorite. The colors are beautiful together. The flowers are all just amazing. Man I love your style in cardmaking. Beautiful done. Love those sweet pink Dahlias on the dark woodgrain background – what a show stopper. Gorgeous set and release. These are all stunning Svitlana. I love the contrast between the backgrounds and the floral images. Just amazingly done! Very classy and delightful designs! Beautifully done! Those daisies! But the painted rose is a must have! Thank you for the inspiration!!! The flower collection brings a classy touch of nature to your cards. I love the woodgrain background! Incredible!!! Love the softness of the Dahlias against the contrast of the wood especially. Fabulous cards! Love all your beautiful color combos! Altenew has the best flower designs ever! Breathtaking! Thank you for sharing those masterpieces, Svitlana! You are super talented! My favorite card is the 2nd one. I just love the pink and that pop of color with the big pretty “Thanks”! Love the cards. So pretty! Beautiful cards! I love them all having a hard time picking a favorite. That woodgrain background is amazing! Lovely cards!!! Absolutely stunning cards! I love your daisy/sunflower card, such lovely colours. Thank you for such wonderful inspiration! Stunning, vibrant cards, Svetlana! The daisies really work as sunflowers too! Lovely, lovely cards! I also see sunflowers in the daisies, so that makes the set very versatile. I just love the dahlia’s, I think they will be my favourites. So pretty! Stunning cards! Love that they’re all floral but still so different! I love the Dalia Blossoms! And it does look dramatic on the PP! 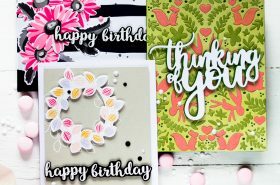 Really enjoying this blog hop, the new release is fab…..your card so all so different just shows how versatile they are……I LOVE your last card, gorgeous and with the darker background the dahlia’s just pop!! These are absolutely stunning!! 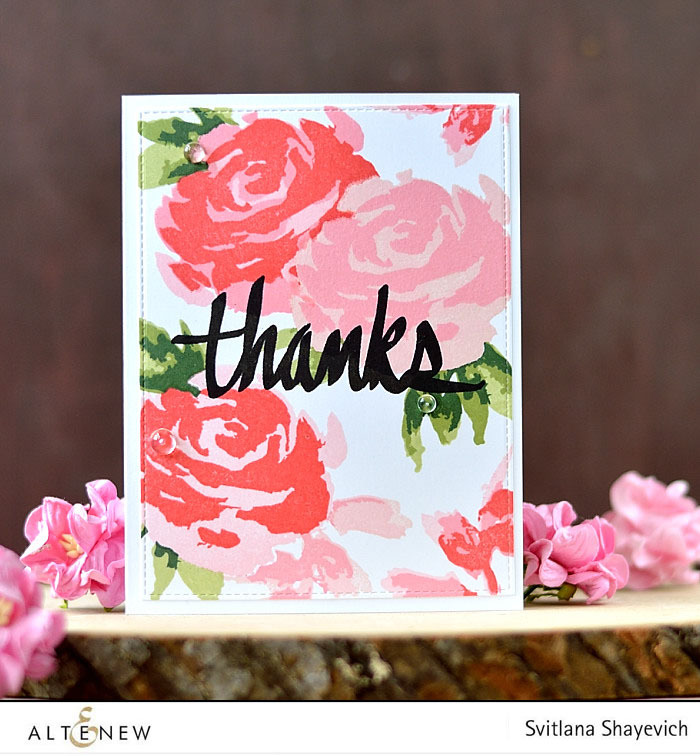 Love your combination of red and pink on the one, and your wood background on another card, just lovely! I kept going back over your cards again and again, seeing new details each time. They are all so gorgeous. Svitlana your cards are amazing, but I am so in love with the way you did the first card. I have not seen anyone make the beautiful sky the way you did. I thought they were sunflower too. I always enjoy seeing what you create. All of your cards are gorgeous! I LOVE the woodgrain card! Oh my gosh these flowers are gorgeous! I love your cards. I especially liked the dahlia blossom . Thank you for your inspiration and thank Altenew for these gorgeous stamps. Wow!!!! Love your cards! Beautiful! Wonderful colors…love the layouts…thanks for the great inspiration! Beautiful cards ! 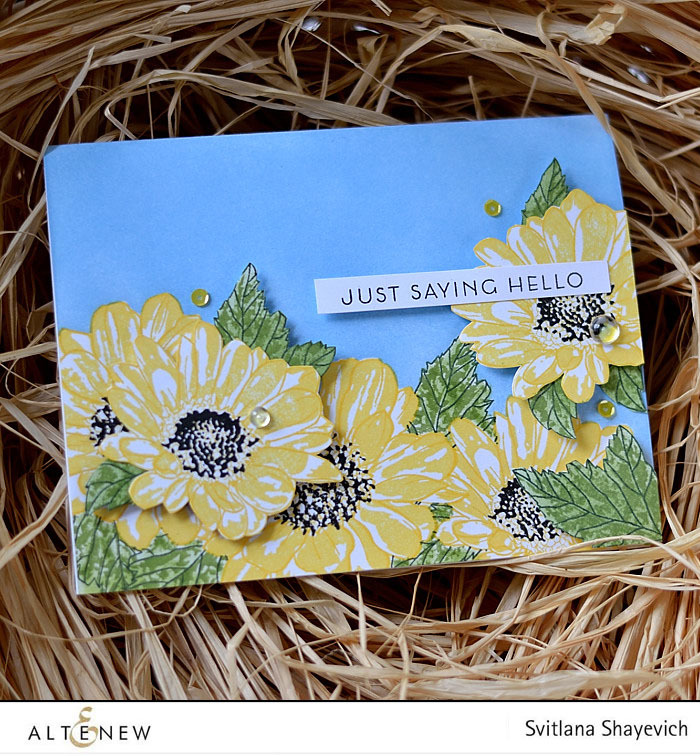 Loved reading about your love for sunflowers ,I have seen sunflower fields and its so bright n sunny enough to cheer one up just like your card .The wood-grain bg on last card looks perfect and makes the flowers pop ! Wow, such stunning florals! I love them all! Beautiful cards and thank you for sharing your memories of your homeland it sounds beautiful. What beautifying cards! Just for You is my fav! 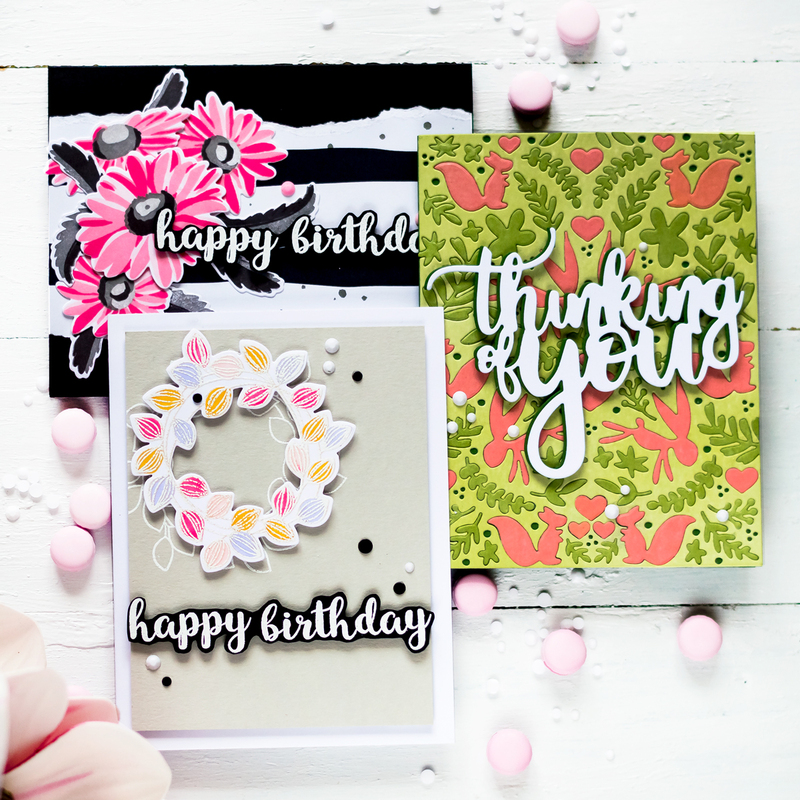 Gorgeous floral cards! I love your designs and choice of colour for backgrounds. I think the dahlias is my favourite! All three of your cards are GORGEOUS! I, too, saw the Spring Daisies as sunflowers. Love your colors used in your backgrounds as they make the flowers pop! Thank you for sharing your talent and inspiration! WOW!! What great and very pretty cards!! Love the Daisy card. One of my favorite flowers. I’m crazy in love with Altenew right now….I can’t get enough of the stamps and videos. Beautiful floral cards. I really like the one with the dark wood grain background. Lovely cards made with the stamps. The color palette is gorgeous! Love your cards they are perfect! Thanks for sharing! Thank You, for tell us about your homeland and the sunflowers. I did not know a lot about them. Now I would live to see them go to sleep at night and follow the sun all day (beautiful). And talking about beautiful… Your cards are! Fantastic florals! Especially loving the one with the pink on woodgrain, makes those flowers totally pop! WOW!! I am in awe of your fabulous backgrounds that you used with your florals to make them POP off the card!!! Stunning design. Love the 3 cards, beautiful colores on them, the stamps are great, every stop on the release blog it’s lovely!!!! All 3 of your cards are so stunning. I also just love the pink on the woodgrain. I love Dahlias so I think this set needs to make a home in my craft room! Love your brown background and all your card is so beautiful. Spectacular; I can not pick a favorite. But I do love the dark wood background in the last card with the soft pink dahlias. And, I love the large roses and the layered sunflowers. Wonderful cards. I especially love the thanks card. The bold sentiment is a perfect match for the soft roses. Wow! Love your cards! They are all so gorgeous! All of your cards are stunning, I especially love the pink flowers against the dark woodgrain, it really makes them pop!! Such gorgeous cards! I just love your Dahlia card. The pink looks so soft and sweet! Such gorgeous cards that you are sharing with us. So much talent! Thanks so much for sharing! Yes, the Dahlia is amazing! Beautiful cards!! I love the Spring Daisy card. I like all of your cards but the dahlias was definately. I thought I would want it the first time I saw a glimpse of the stamp set. Now I know I want it. Your cards are lovely. I really enjoyed your story about sunflowers! Your cards are gorgeous and but I especially love the one on the dark wood background. Love this release. Love the pop of yellow against the blue! Beautiful cards! I love Altenew’s florals, they are the best. Another excellent release! Very beautiful cards: different and wonderful! I really like the colors you chose for the lovely flowers…that painted rose is quite something…will go on my list for future purchase. I did buy the Dahlia set and can’t wait to get to work with it. Love the cutouts! Love the contrast on the card with dahlias. Stunning cards that you should be very proud of.Just perfect. Beautiful cards!! Love the dahlias on the dark background. Thanks so much for the inspiration! loved all your cards sunflowers are so nice. WOW! You have created such a beautiful garden! The new stamps are fabulous! Very beautiful card. It looks like the new realse is amazing. I would like to have one of your stamp set. really gorgeous set of cards!!! Awesome job on all your cards. Love the blue background. Love the daisies on the blue background. Thanks for sharing your lovely cards! Your beautiful cards are making it very hard for me to decide which stamps set to order! Great cards! Love the dahlias and the wood background so pretty! Lovely cards, and the dahlia is my fave, but the sunflower is a close second!! I would surely love to see those sunflower fields….they sound awesome! Thanks for your inspiration! Your cards are amazing! Love the Altenew stamps. Ooohhh I like your card with the yellow flowers and blue background…..just wonderfull. Did you watch the EuroSongfestival? Congratualtions on Jamala of the Ukraine who won this year. 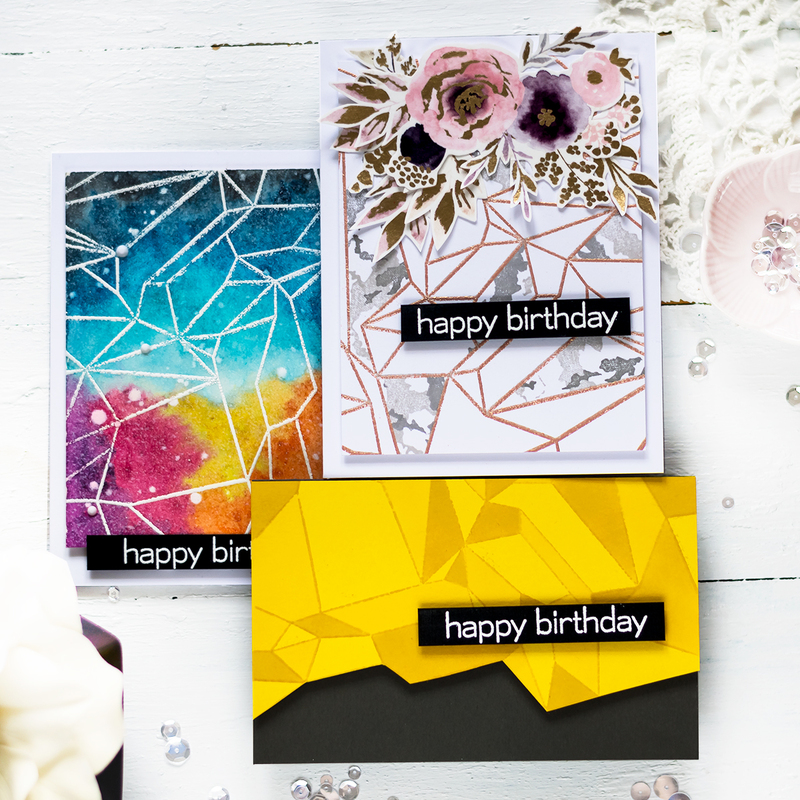 Very nice cards – glad you are trying to find ways to use that pattern paper!! The flower stamps are beautiful! They make such beautiful cards! Absolutely gorgeous cards – especially those sunflowers. Love all the new Altenew flowers. WOW – all of these cards are beautiful, incredible, lovely beyond words, and super gorgeous!!! 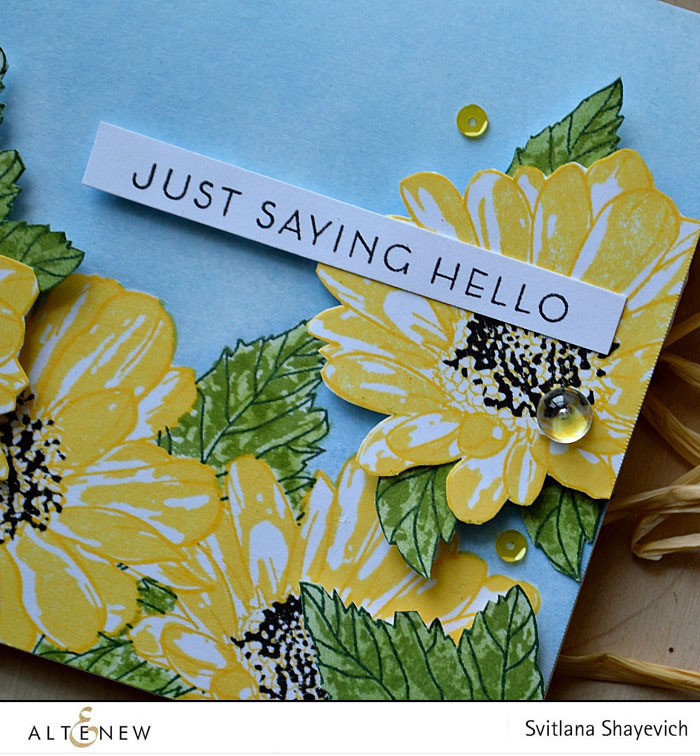 Love the Spring Daisy card – that is one of my favorites from this release!!! Beautiful cards, all of them but my favorite is the sunflower, so bright and cheery! Wow! Those flowers are stunning! Can’t imagine how amazing your homeland would be! Thanks for sharing! These are wonderful! Oh so pretty. Oh so beautiful! The one on the wood grain background is SO striking! OMG! I knew sunflowers turned towards the sun, but I didn’t know they closed up shop at night with their little petals! What a fantastic picture you painted with that memory. I also had no idea Ukraine was the leading sunflower producer!!!! Anyway, your cards are GORGEOUS! 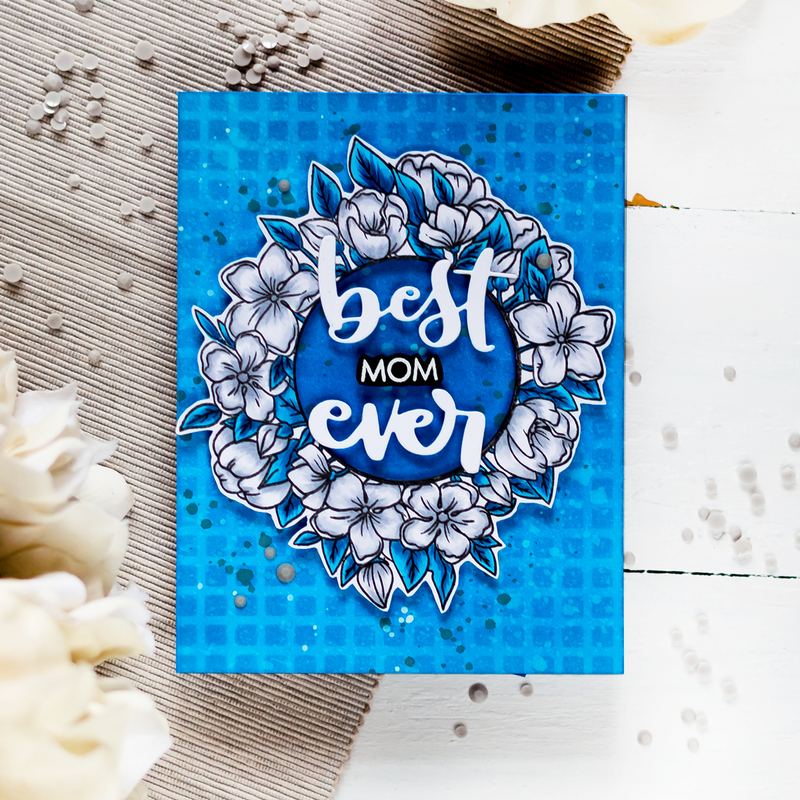 Love the woodgrain background against the beautiful blooms of the last card. Have a beautiful day! I love all your cards. Altenew’s floral stamps are the best. The Spring Daisy and dahlia stamps are my favorite from this release and I love the cards you made with them. LOVE your flowers and colour combos, LOVE your designs too!!! Beautiful cards! Love the wood grain background. It is great to pair up these intricate flowers with simple sentiments. Thanks for your wonderful examples! Beautiful colors and beautiful flowers, these are awesome cards. Very beautiful cards ! My favorite is the Dahlia Blossom card ! This stamp set is so nice. Thanks for sharing. 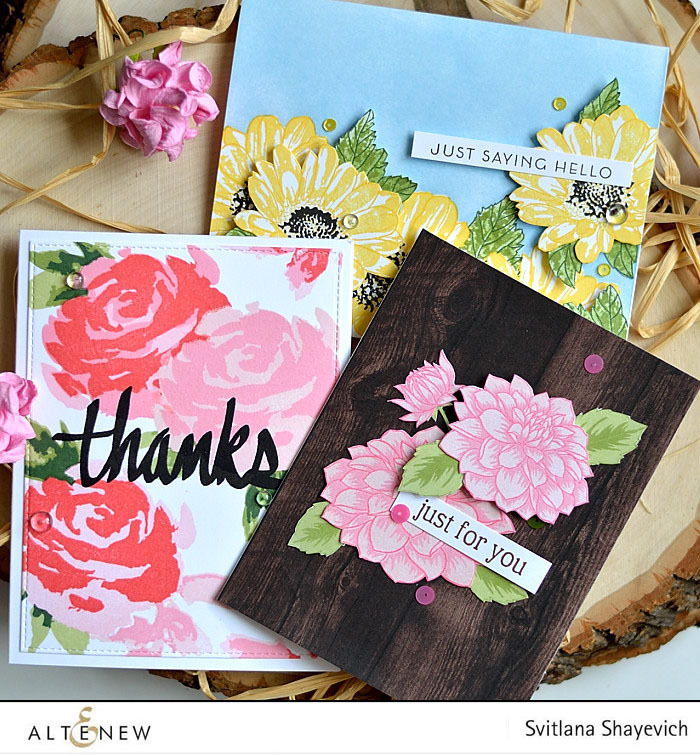 Your cards are just beautiful – especially the softly colored dahlias on the dark wood bg! Just love that one. Gorgeous cards! I love all the floral images. Your cards are beautiful. Really loving the yellow flowers on this rainy day. Very pretty card creations you made to share. I love the rose one and the dahlia one the best :). OMG…the wood grain stamped card is my favorite…thanks for sharing…❤️Beautiful!! Stunning cards. Loved the sunflowers one. I saw lots of sunflower fields last summer when I travelled from Budapest to Zagreb. The are amazing. Your dahlia card is simply stunning. I like how each of your backgrounds really accentuate the flowers. So pretty. Your cards warm my heart. The colors are beautiful. Lovely cards! They are all so beautiful! Your three cards are stunning, especially the sunflowers and dahlias. Thanks for the inspiration! I love all of your cards! The Sun Flowers are Devine! Bright and friendly! 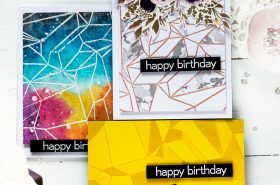 awesome cards – great colors and designs. Gorgeous cards! Love the colours! ? Gorgeous cards ! Lovely Lovely can’t wait to have a go with the new Stampsets ! ?? WOW… they all are beautiful! Loving your work with layering of those blooms. I love your Dalia card! The dark wood background and soft pink flowers look absolutely stunning! Your cards are great ! My favourite is your Sunflower card (although it’s a daisy-set for me – thanks to my grandma, her name was Margriet, what is the dutch translation of Daisy). I love Sunflowers too ! They are so beautiful ! Each year my parents have some in their garden. I love sunflower-seeds in salads, bread, … yummy ! Thank you for the inspiration and sharing your talent ! And congratulations for Ukraine for winning the Eurovision Songcontest ! Beautiful florals!!! Thanks for the chance to win! My absolute favorite is the dahlia one. It’s simple (looking) but stunning. All your cards are beautiful. My favorite is the dahlias on the dark background. Very nicely done. TFS! All three cards are very striking. The first one looked like you stamped and die cut sunflowers, adhering them to light blue card stock. However, you masked them and inked the blue sky. Also agree those dahlias are so realistic, Svitlana! Amazing cards Svitlana ! Love how your last card turn out it is my favorite love the soft Colors from the flowers, and the bold background! Wonderful! Loved all three cards! Especially the third one with its beautiful, dark background. It is like wandering through a forest and coming upon lovely, delicate flowers blooming at the base of a magnificent tree! What a beautiful trifecta of perfection! I love all three of these stunning cards!! TFS! Your cards are so pretty. I love that coral berry color. It’s my favorite. Fabulous! The dahlias are my favorite design- they jump off the woodgrain background ! And good for u in seeing the sunflowers “within” the daisy stamp it what we all want- to get the most out of our stash- and u showed us how….thank you! All three cards are just lovely! Beautiful cards! I love the look of each of them! Love the dahlia on the woodgrain background!! Your cards are so bright and cheery! Love them! Such lovely cards!! The dahlia card is definitely my favorite!! I love the daisy stamp set. It is darling as a sunflower too.One of my favorite flowers are gerber daisies. Beautiful card. All of your cards are lovely. These are really nice stamp sets.